Karen Smith Colorado physical education teacher placed on paid administrative leave after assaulting student refusing to stand for the Pledge of Allegiance. 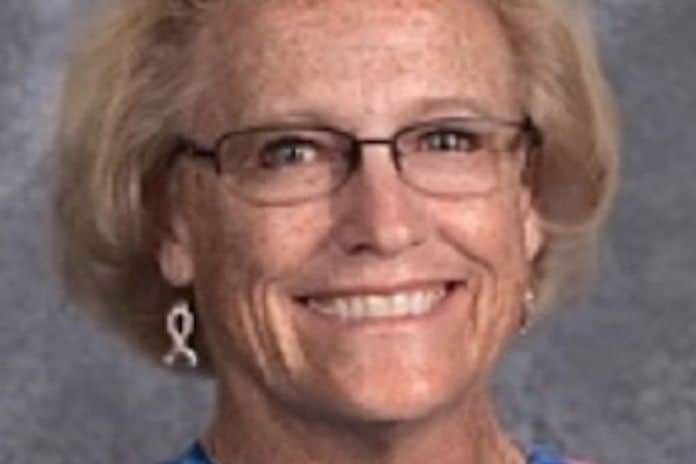 Karen Smith a Colorado physical education teacher has been placed on paid administrative leave after allegedly assaulting a student after refusing to stand for the Pledge of Allegiance. A report via CBS Denver confirmed the 20 year veteran middle school teacher ‘assaulting’ the student at Lafayette’s, Angevine Middle School circa noon, Thursday. Come Saturday, no charges had been filed against the ‘strict’ teacher. It wasn’t immediately clear why the student had declined to stand for the Pledge of Allegiance, and whether they may have been using the occasion as a symbol of protest as has been the case of the NFL league. ‘I am reaching out to you tonight to let you know that we will have a substitute teacher working with some of our PE classes for the time being,’ Principal Mike Medina said in a letter sent home to parents on Thursday night. ‘While I cannot share much information, following an incident today at school, Ms. Smith was placed on paid administrative leave. We are working closely with our partners at the Lafayette Police department,’ the letter read. Karen Smith Angevine Middle School pledge of allegiance scandal: A case blown out of proportion? Of note, a report via The Denver Post told of school district policy giving students the choice of sitting or standing for the Pledge of Allegiance. The media outlet went on to quote a parent saying, there hadn’t been any previous altercations involving the teacher. Two other parents who spoke to CBS Denver off camera said they believe the story has been ‘blown out of proportion’ and expressed disappointment.